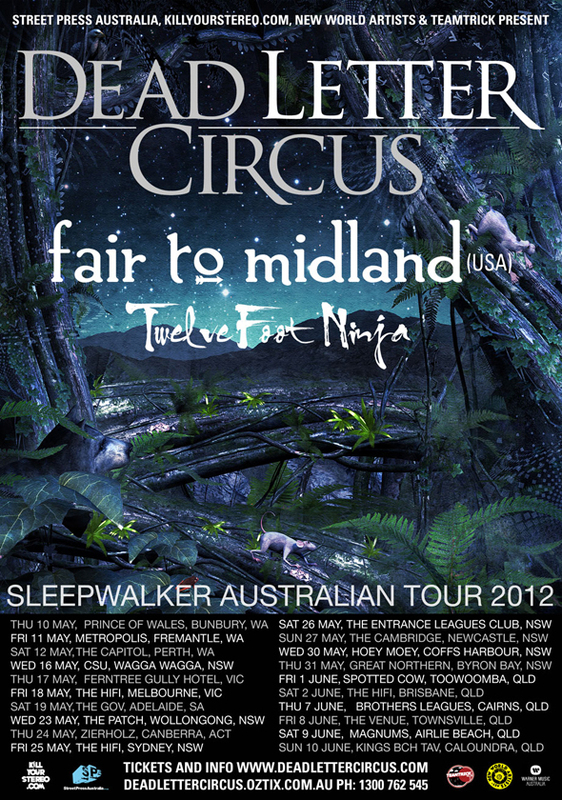 DEAD LETTER CIRCUS (DLC) are pleased to announce the 'SLEEPWALKER AUSTRALIAN TOUR 2012' with amazing special guests FAIR TO MIDLAND (USA) and TWELVE FOOT NINJA (AUS). The Sleeper tour will take in 20 dates right around the country and DLC have hand picked two of their favourite rocking bands to make every show an epic event. After touring the US late last year alongside Fair To Midland, DLC were blown away by their musicianship, killer songs and high intensity show, and can't wait to bring the guys to Australia. The momentum keeps building for DLC in the US with several key rock studio stations adding their single 'One Step' to rotation, and the band hitting #5 on the Taking Off radio chart this week. DLC are heading back to the US for showcase performances at SxSW in Austin and then onto a US East Coast and Canadian tour throughout April, dates and venue info coming soon. The band's US label Sumerian Records are thrilled with the early radio success and the growth of the band in the market, and are certain to capitalise on the buzz building around the Dead Letter Circus record. Stay tuned for the release of a new single to be blasting the airwaves soon! Tickets On Sale FEBRUARY 27! Search for UNWRITTEN LAW here. Search for attack! attack! here. Search for ENTER SHIKARI here.